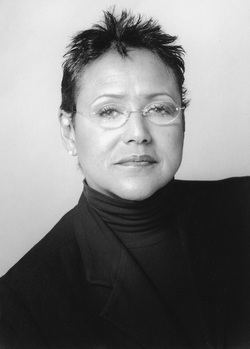 Elaine Brown became, in 1974, the first and only woman to lead the Black Panther Party. Today, as an activist, writer and popular lecturer, she promotes the vision of an inclusive and egalitarian society, focusing on resolving problems of race, gender oppression and class disparity in the United States. In her autobiographical memoir, A Taste of Power: A Black Woman’s Story, Brown recounts her life from the ghettos of North Philadelphia to her leadership in one of the most important and militant civil rights groups in U. S. history. The book has been optioned by HBO for its planned six-part series, "The Black Panthers." Brown is also author of New Age Racism and the Condemnation of “Little B” (Beacon Press, 2002), the story of Michael “Little B” Lewis, a 14-year-old sentenced to life in prison for a Georgia murder Brown says he did not commit. Publisher's Weekly called the book a "damning, often excruciating account of racism in contemporary American society... a narrative that crackles with tension and enormous empathy…extraordinarily powerful.” Brown is Executive Director of the Legal Defense Committee for Michael “Little B” Lewis, working for a new trial. She is also president of the nonprofit educational corporation Fields of Flowers, which aims to build a model education center for Black and other poor children. 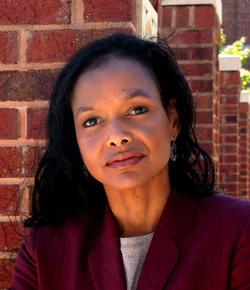 She is a Board member of the National Alliance for Radical Prison Reform, a board member of Mothers Advocating Juvenile Justice, and Vice-President of The Dr. Huey P. Newton Foundation. Having studied classical piano for years, Brown has recorded two albums of original songs, one for Motown records, and her 1969 album, "Seize the Time," which includes The Black Panther Party National Anthem (The Meeting), was re-released in January 2007 by Warner Brothers. by the sophomore jinx theory, it’s safe to say the response across the board was nearly 100% positive. 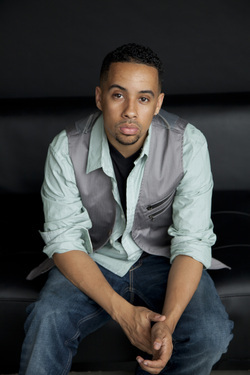 Ise first gained national recognition competing in national poetry slam competitions in his late teens. In 2001 he won the National Poetry Slam Competition, skyrocketing his popularity amongst the ever growing Spoken Word/Hip-Hop Theatre audience. He has been featured on Russell Simmons' Def Poetry Jam on HBO. He has also shared the stage with Gil Scott-Heron, Dave Chappelle, Lauryn Hill, Talib Kweli, Dead Prez, E-40, Harry Belafonte, Mos Def, Malcolm Jamaal Werner, KRS-One, Martin Luther, Saul Williams, Ben Harper, Erykah Badu, Zion I, and The Coup to name a few. 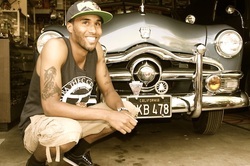 Jetpack Jones is one of southern Cali's fastest growing artists. He has a very unique approach to rap, using his imaginative style of thinking and his positive outlook on life, he creates music that people can really vibe to. MARGARITA ANDERSON IS THE FOUNDER AND CEO OF THE EMPOWERMENT EXPERIMENT (EE) AND THE EMPOWERMENT EXPERIMENT FOUNDATION, INC. (EEF). Margarita Anderson and her family made history and dominated headlines as national media covered their real-life case study in self-help economics. The Anderson family lived exclusively off Black business and talent, and bought only Black-made products for an entire year. Their experiment resulted in a landmark study conducted by Northwestern University’s Kellogg School of Business. Since the experiment, Margarita has become voice of consumers of all backgrounds who want to make sure their buying power positively impacts struggling minority communities. A sought-after speaker, Margarita represents The Empowerment Experiment (EE) at universities, conferences, community events, corporate functions and in the media asking Corporate America to demonstrate it values the African American consumer market by engaging in substantive supplier, vendor and franchisee diversity. Her movement also urges consumers, especially other middle and upper class African Americans, to proactively and publicly support the corporations that represent and reinvest in Black communities. The Empowerment Experiment’s mission is to make sure more quality Black-owned businesses get supported – as standalone entities and as suppliers – so that everyday consumers can counter the social problems that disproportionately impact Black people. She has appeared on CNN, MSNBC, Fox News, and CBS Morning News, among many other national television and radio shows. Margarita is the author of the critically acclaimed book about The Empowerment Experiment (EE), “Our Black Year”. Proceeds from the book will benefit The Empowerment Experiment Foundation, a 501c3 started by her family. Maggie is a first-generation Cuban-American. Maggie has a BA in Political Science from Emory University and earned a JD and MBA from the University of Chicago. The Honorable Minister Louis Farrakhan, leader of the Nation of Islam, was born May 11, 1933 in Bronx, N.Y., and was reared by his mother, along with his brother, in Roxbury, Massachusetts. Minister Farrakhan had developed at an early age a strong sensitivity to the plight of Black people through his mother engaging him and his brother in conversations about The Struggle for Freedom, Justice and Equality. She also exposed them to progressive material such as The Crisis magazine, published by the NAACP. Popularly known as “The Charmer,” he achieved fame in Boston as a vocalist, calypso singer, dancer and violinist before joining The Nation of Islam in 1955 after attending The Nation’s annual Saviour’s Day convention in February of that year. Three years after the departure of the Honorable Elijah Muhammad in 1975, and a re-appraisal of the condition of Black people and the value of the Teachings of his teacher, Minister Farrakhan decided to return to the Teachings and Program with a proven ability to uplift and reform Blacks. 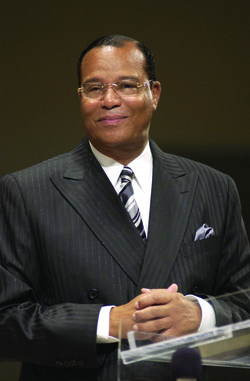 His tremendous success is evidenced by mosques and study groups in over 120 cities in America, Europe, the Caribbean and missions in West Africa and South Africa devoted to the Teachings of the Honorable Elijah Muhammad, as well as numerous history-making milestones, such as: Publisher of the Final Call Newspaper, founded in 1979; World Friendship Tours and Peace Missions throughout Africa, Asia, Central America, South America, the Middle East, the Isles of the Pacific and the Caribbean; Authot of A Torchlight for America, published in 1993; The Visionary Gatherings of: The Million Man March/Holy Day of Atonement, Reconciliation and Responsibility (1995); The Million Family March (2000); and The Millions More Movement (2005); A Prostate Cancer survivor, with a foundation established in 2003, The Louis Farrakhan Prostate Cancer Foundation.